Just like owning an oven doesn’t equate to being a baker, having a winch doesn’t mean that you know how to use it. While 4×4 veterans are typically familiar with the tips and tricks of safely operating a winch, those who have little experience may need a quick study session before winching to make sure that they get out quickly, safely and without damaging themselves or their rig. Protecting yourself and those around you is the first and foremost concern while winching. 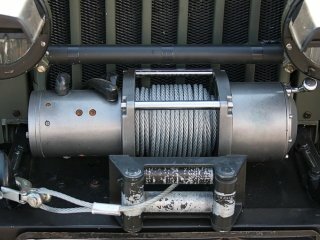 Winches that have been overloaded, set-up improperly or coupled with unreliable accessories are prone to failure. And failure could easily mean a snapped line whipping someone in the face. And that, is an expensive trip to the emergency room. Wear leather gloves, pay attention and keep one person in charge of the winch controls to avoid confusion in the operation. Once you’ve got your gear laid out and everybody knows their role, you’re ready to get winching. Attach your winch’s remote to the designated port. Route the line so that the remote cord isn’t at risk of being pinched, depending on where you’ll be operating the remote from. With the remote in place, unwind a couple feet of line so that enough slack is available to disconnect the winch hook from its anchor point. This is an important one! In order for your vehicle to be freed successfully, the winch must be attached to a secure anchor point in a straight line from the point where your truck is stuck. Ideally, try to find a natural, secure feature like a tree, large rock or stump to hook the cable to. When a handy piece of nature isn’t available, you can utilize another vehicle as the anchor point, or a creative set-up. Deeply buried tires or logs with a chain wrapped around them can provide a reliable anchor point when you’re in a pinch. Adjust the winch controls to disengage the clutch and pull the winch line toward the anchor point in a straight line. Watch out for rocks, branches and other “nature litter” that your line may become tangled in. Wrap a choker chain or winch strap around the anchor point in a u-shape, at the lowest point possible. Slide a D-shackle through the ends of the choker or strap and secure the shackle’s anchor bolt. Beware of a heavy hand in tightening the shackle bolt to avoid over-tightening when a load is applied. Otherwise, you’ll never get the thing undone. Slide the winch hook up through the D-shackle and re-engage the clutch back at the winch itself. Begin to wind the winch line back in until there is slight tension on the line. Double check the connections at the anchor point and make sure that you and your buddies are well out of the way of the winch line, should something go wrong. Popular winch manufacturer, Warn, offers a helpful tip for safety by suggesting throwing a heavy blanket over the taut line in case of breakage and creating “no people zones” in front of, behind and in the line of the winch cable. When you’re sure that everyone is out of harm’s way, it’s time to start tugging….Finally. Slowly spool the cable back onto the winch using the remote control. While winching, it is best to have the vehicle being recovered on, with the engine running and a driver inside. If it’s a reasonable option, apply the gas and work with the winch to move the vehicle with both the winch cable and drive tires. Continue reeling in the cable until the vehicle is on a stable surface. You’ll know you’ve succeeded when the vehicle can drive completely under its own power. At this point, stop. Engage the vehicle’s emergency brake and re-wind the cable by applying slight tension while walking the rope inward. Watch to make sure that the line does not become tangled while re-spooling and never place hands or other important body parts near the drum or cable while re-spooling. Once the winch is back to square one, you’re ready to continue your adventure. Remember, the straight line pull is just one way to utilize a winch to free a stuck vehicle. Research and practice multiple rigging options before using your winch in a sticky situation for the first time. It’s a great excuse to bring some buddies over and play trucks in the driveway; all in the name of preparation.